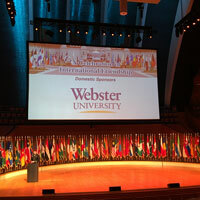 Webster sponsored the International Friendship Gala with international officers and the CGSC Foundation. Katie Ervin, Midwest regional director, was elected to the Command and General Staff Foundation board of trustees. The trustees manage, supervise and control the business, property and affairs of the foundation, which provides resources and support to the U.S. Army Command and General Staff College (CGSC) based at Fort Leavenworth. The Foundation helps to advance the profession of military art and science by promoting the welfare and enhancing the prestigious educational programs of the CGSC as it develops tomorrow’s military leaders. Ervin will also serve on the Foundation’s development committee to support their fundraising mission. with members of the local community. 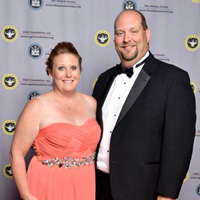 In September Webster through its Fort Leavenworth campus location was a domestic sponsor of the CGSC Foundation's third annual Celebration of International Friendship Gala. This black tie evening brings together military and surrounding Kansas City community members together to welcome the 112 international officers from 88 different countries who are attending the Command and General Staff College this year. The officers and wives attend in their countries traditional dress. Ervin represented Webster University with her husband at the event, which was also attended by seven Webster international students and their spouses. See more pictures and info here. 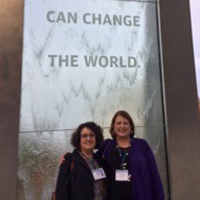 Holly Hubenschmidt, Erik Palmore, and Laura Rein co-authored a panel presentation, “Global Leadership Development: Transformation through Collaboration” that highlighted Webster's Global Leadership Academy at the International Leadership Association Annual Conference. The conference brought together leadership scholars, educators, students, consultants, and executives from around the world to explore the conference’s theme, “The Dynamics of Inclusive Leadership,” through plenary sessions, workshops, and roundtables, Nov. 2-5, in Atlanta, Georgia. Their presentation focused on Global Leadership Academy (GLA) as a case study for collaborative and inclusive leadership and included data collected since 2013 that show positive impact of the GLA on the participants and, through their leadership, on the University. In addition to their other duties at Webster, Rein (dean of University Libraries) is director of GLA and Hubenschmidt (head of Instruction Liaison Services) and Palmore (director of Faculty Development Center) are GLA co-directors. Kathy Gaynor, instruction and liaison services librarian and curator of the Webster Archives, had a teaching reflection published in the book, "The One-Shot Library Instruction Survival Guide." Gaynor sought a better way to help counseling students understand the relevance of journal articles and the research literature. The exercise, which she uses in each Foundations of Counseling class, uses a traumatic situation currently in the news and asks students what they would want to know if they were called upon to help with persons affected by the incident. For example, "I have the students get in groups and come up with questions they would ask a veteran counselor if they could consult with one before going into the field," she said. "Then I talk about another group of experienced counselors whom these students new to the profession could call upon for advice: the authors of research in professional journals. Finally, she helps them learn how to tap into these scholarly conversations by using the library databases to find journal articles.